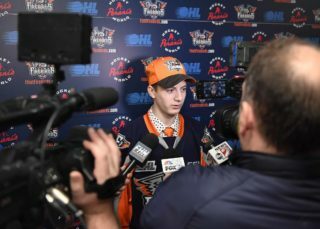 Flint, Mich. – The Flint Firebirds return back to the Dort Federal Event Center this Saturday night when the club hosts the Guelph Storm at 7 p.m.
You’re invited to Hot Wing’s 3rd Birthday Party! 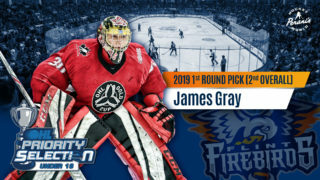 To celebrate, the first 500 fans in attendance will receive orange and blue pom-pom’s compliments of Perani’s Hockey World and the first 1,000 fans will receive the official Flint Firebirds’ magnet schedule compliments of Health Alliance Plan (HAP) and Little Caesars Pizza. 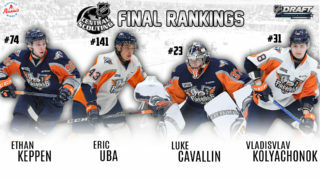 There are 10 players with NHL ties between both Flint and Guelph’s active rosters consisting of the Firebirds’ Dennis Busby (Arizona Coyotes), Ty Dellandrea (Dallas Stars), Fedor Gordeev (Toronto Maple Leafs) and the Storm’s Liam Hawel (Dallas Stars), Cam Hillis (Montreal Canadiens), Ryan Merkley (San Jose Sharks), Isaac Ratcliffe (Philadelphia Flyers), Dmitri Samorukov (Edmonton Oilers), Nate Schnarr (Arizona Coyotes) and Alexey Toropchenko (St. Louis Blues).